Good afternoon, blog world. 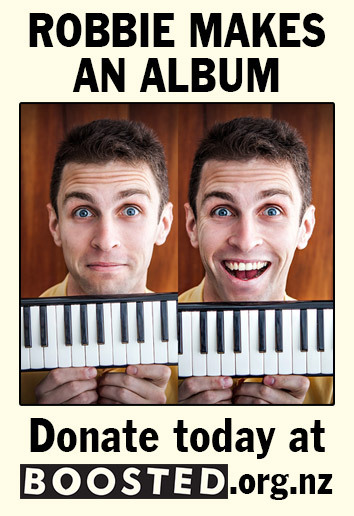 I have just launched a crowdfunding campaign to make an album of my comedy songs. My ambition is substantial: NZ$9,000. The reason: I want to record real musicians in real, well-equipped studios. I’ve got it all planned out! There’ll be a rich sound of strings, winds, brass and rhythm, and it’ll be made freely available on Spotify. But I can only make this if you support my fundraising campaign. I’ve chosen boosted.org.nz, a crowdfunding platform run by the Arts Foundation of New Zealand, who have hosted successful crowdfunding campaigns for friends of mine in the past. Studios are booked: Ellamy Studios in Auckland and Orange Studios in Christchurch. Players are booked: drummer Jono Sawyer, clarinettist/saxophonist Yvette Audain, and violinist Sarah McCracken, among others. So will you help me? Donate at boosted.org.nz/projects/robbie-makes-an-album today. My campaign closes at midnight Thursday 14 September NZ time. Let’s get it done! Hey Chicago! You can also come to a fundraiser gig of mine. It’s on Sunday September 10, 8pm at MCL Chicago in Lake View. There’ll be songs of mine which will feature on the album, plus musical theatre, sketch and more. I’ve lined up a dozen fellow performers: MC Alex Garday; guest artists Jake Dewar, Catherine McDonnell, Gretchen Eng, Andi Sharavsky, Kathryn Krause, Lucia Rieur and Sarah Antao; musicians Carl J. Lamark, Jesse Greco, Robert Campbell and Aaron Homard; and stage manager Sam Cain. Tickets are $25 in advance, $35 at the door. You can book tickets here. And you can give generously at boosted.org.nz. Thank you!